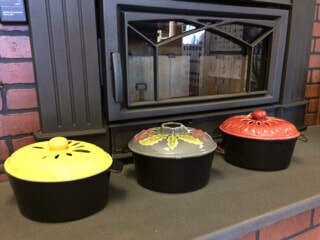 HOW CUTE ARE THESE STEAMERS AND HEARTH CRICKETS!!! Firebrick, stove gaskets in all sizes, gasket cement, high temp paint, Speedy White cleaner, chimney brushes and rods, Eco Fan, fireplace grates/gloves, fireplace rugs, replacement glass, stoveboards, chimney caps, lock top dampers and more. Ask us if you are trying to find a particular item, we may be able to help!! We carry and use DuraVent Brand of double/triple wall, direct vent and pellet vent chimney products. We carry the 24 ga single wall black stovepipe, 24 ga single wall stainless pipe and Ventinox flex pipe. There are many pipe sizes and pieces available for almost all situations. Again, please ask if you need another brand or item, we may be able to get it! Usually we can get most pieces in two days, if we don't have it in stock. Need help on how to vent...ask the expert....Gary will be happy to assist in finding the correct and safest way to vent your wood, gas or pellet unit!